Last Friday, I met Tim Jackson – Head of Strategic Marketing at the Hilton London Bridge. We talked about his first year at Unum, the leading income protection provider in the UK, their social media strategy, and the importance of digital engagement as part of ‘Ask Unum’ and their educational campaign ‘Back Up Plan’ for employees, advisors and employers. 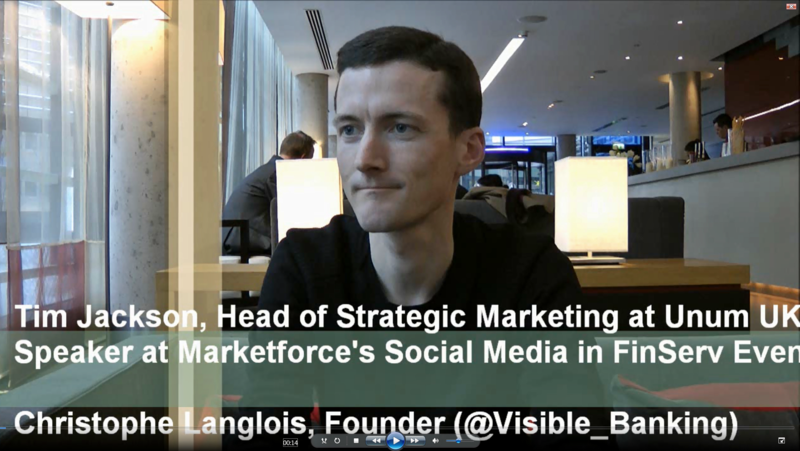 On 21st March 2012, I will be contributing to my fourth marketforce event in the UK, this time the whole event is dedicated to social media in financial services. I am aiming to record a series of video interviews with most of my fellow speakers from the financial services industry. I invite you to watch my video with Tim. Come and join us on 21 March, you will have a unique opportunity to connect with Tim, myself and the other speakers and ask us all your questions on social media strategy and digital engagement. I would like to remind you that the readers of Visible Banking can enjoy a 10% discount on their tickets. You will find more info HERE. Previous articleWill Twitter Be More Than a Glorified RSS Feed to the Federal Reserve?